•	Order of Battle: World War II, featuring the bootcamp missions and the first mission of each DLC. 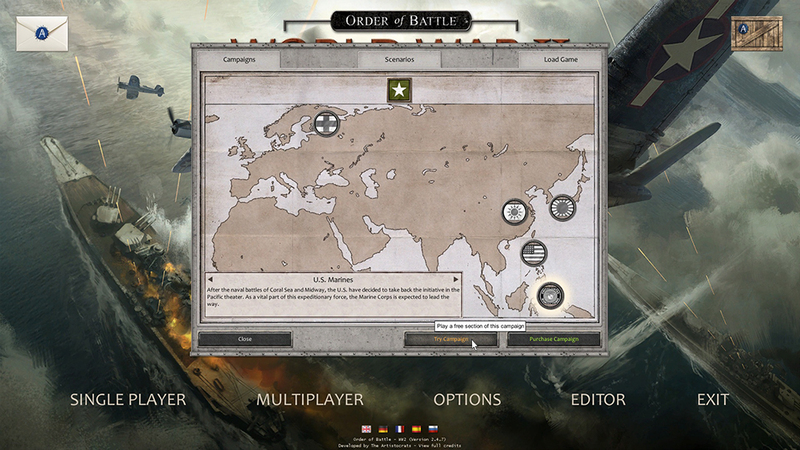 •	The Order of Battle: U.S. Pacific DLC, featuring the American Pacific campaign. •	The Order of Battle: Rising Sun DLC, featuring the Japanese Pacific campaign. Let’s click on the US Marines campaign (at the bottom). 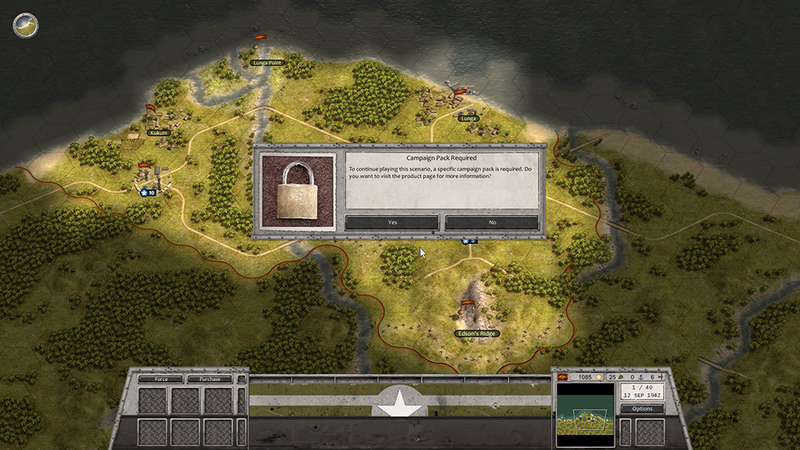 A description is displayed on the left panel and now two buttons have appeared on the right. 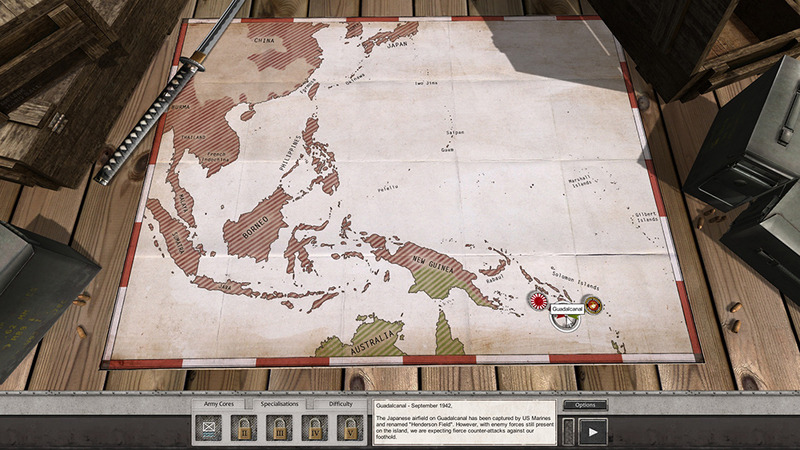 If you click on “Try Campaign”, you’ll be able to see the campaign screen and launch the first scenario, which is Solomon Islands. So you can enjoy this scenario with absolutely no restrictions. After a few hours of intense combat, you finally beat the scenario and switch to the next one in this campaign (which is Guadalcanal). 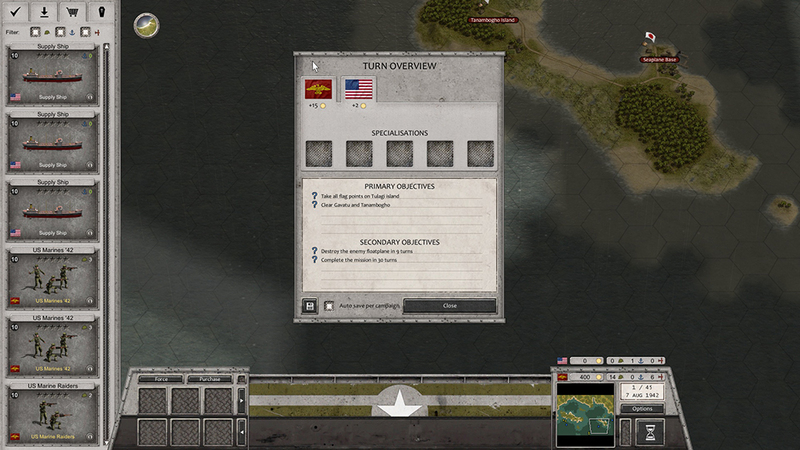 Now you can read the briefing, deploy your units and plan your future moves. But when you’ll press end turn, you’ll see the following screen. 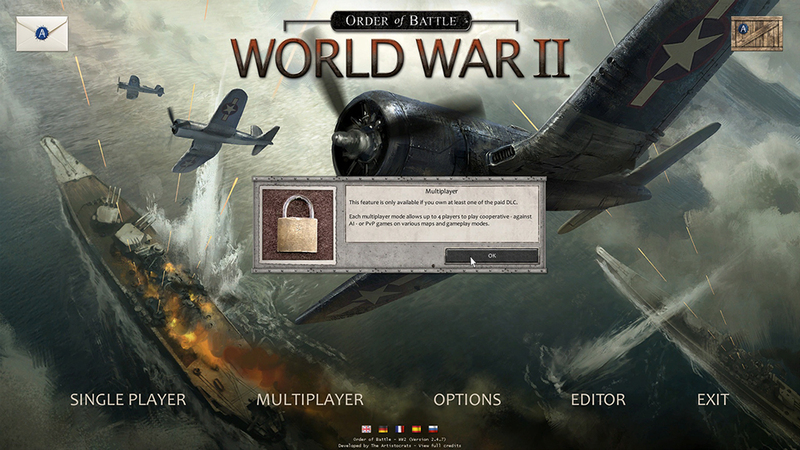 Either you want to continue your amazing wargaming experience and purchase the DLC to unlock the whole campaign or you can quit and go back to the main menu. In any case, your progression is saved so even if you decide to purchase the campaign later, you’ll be able to keep the experience that your units earned in the first scenario. Also, as mentioned previously, the editor, multiplayer modes and community content are not available in the free version, but you only need to own one of the DLCs to instantly unlock this content! Finally, here is an example of what happens when you buy (or already own) a DLC of Order of Battle: World War II. Every single campaign owned appears with bright colors in the campaign screen. Also instead of the buttons previously displayed, you now have a “Launch” button. Click on it and you’re ready for a full campaign of amazing scenarios! Re: Order of Battle goes global! What a totally brilliant idea! Congratulations! This sounds like a great setup, I like the implementation. Sounds absolutely fantastic! I look forward to it all. As it stands, OOB Pacific is my favorite PC game. Looks like it will only get better. Thanks! Looks like some folks have their thinking caps on, for sure. Good luck! When is this happening? Will it be handled by an update? Blathergut wrote: When is this happening? Will it be handled by an update? In another thread adherbal said the next update would bring the game to the "World War II" version. He has also delayed winter war to July because of this. And yes, it'll be a patch/update and will convert your game automatically and retain all the Campaigns that you already own. Shards wrote: And yes, it'll be a patch/update and will convert your game automatically and retain all the Campaigns that you already own. Okay, good to know! Many thanks! *PLEASE* add more coop multiplayer scenarios! Maybe even some campaigns! I'd even pay extra for more co-op!!! !